THE EYEBALL MUST BE OBEYED. Going to keep this super-brief (no, really, I mean it this time) to give my peepers a rest, so let me just answer a couple of questions. He is of course referring to this photo, which is probably about as stoned-looking as you’ll ever see me, since the anesthesia and other assorted chemical-goodies they doped up with really threw me for a loop this time. …Anyway, yes, that is indeed the same shirt I wore for the previous two operations. I was instructed to wear a “loose-fitting, short-sleeved shirt” and that was the loosest-fitting, shortest-sleeved shirt I had available. Also, it’s kinda oldish and worn out, not unlike its wearer, so I wouldn’t mind if, say, blood or eye-juice got squirted on it. The big, long wall rack is for the periodicals (though I do have a couple books up there)…I tend to leave stuff up there for a month before filing them away, though I have enough space to keep some items up for longer if I wish. (For example, I’ve been keeping all of Doomsday Clock up there, and until just recently I had every issue of the new Uncanny X-Men series on the new comics shelf as well.) In general, the week’s new releases are on the top two rows, and the previous month’s (or so) books are on the bottom four. 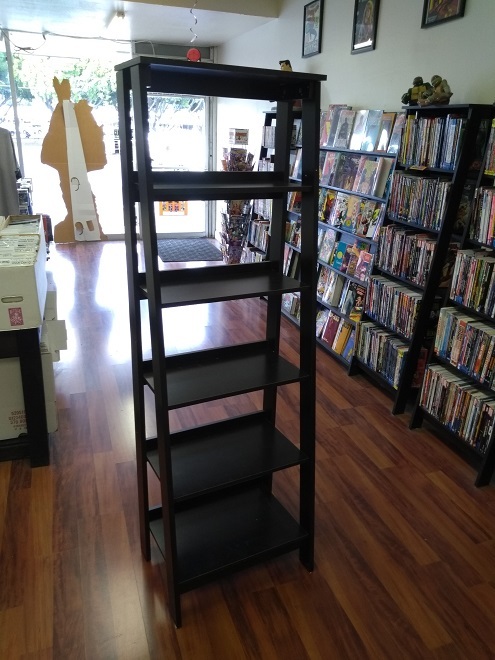 The trade paperback shelves (which I was adding to with that bookshelf I just built and took that picture of) are on the opposite wall, though I have a three-leveled table near the front center of the store where I try to put all the new weekly TP and graphic novel arrivals. After that they get moved to the big bookshelf (that looks sorta like the comic racks) where they’re displayed front facing, then eventually movied to the regular bookshelves, spine out. Though some books of particular interest are kept on front-facing display (like Saga or the Star Wars books). I do! I didn’t take a picture of it, but I have a small table up near the register that holds a few long boxes of bargain comics (usually stuff acquired for cheap…or just dumped on me…in collections, or excess leftover stock, or material I just don’t think I’ll be able to get a premium back isue price for at any point in the near future). On the three-leveled table I mentioned previously, I have a section of bargain trades and graphic novels, usually items I got on clearance from one of my distributor’s regular discount sales. OKAY ENOUGH QUESTIONS, Mike’s Eyeball needs to rest. I’ll be back Frieday…IF THE EYEBALL WILLS IT. But seriously, buy lots and lots of comics from me. Anyway, it’s done now, with the assistance of a helpful customer (since me using any kind of tool is usually an invitation to disaster or perhaps self-maiming). I now have more space for graphic novels and trade paperbacks and thick comics or whatever you want to call them, though I’ve already made good progress abhoring that vaccuum and getting those shelves filled up via the subsequent refiddling of the stock. This does tie into something I’ve been thinking about of late, which is the matter of space. I’ve been spending the last several months getting a lot of those boxes of old comics in the back processed and priced up, with lots more to go, requiring me to find places to put them. The three large metal shelving units I have behind my counter hadn’t had their topmost shelves utilized, so I finally threw some boxes on top there and began the giant game of Tetris of resorting and reorganizing and relabelling all those bins, both behind the counter and on the floor. When I first opened, I didn’t have anything on the bottom part of the tables. I hadn’t even really filled up the tops of the tables…I used half of one table to hold comic supplies. Now I’ve expanded the back issues to occupy those bottom sections…mostly “Misc. Publisher” slots rather than individual titles, which I try to keep up top. So there’s like “Misc. Image,” “Misc. Dark Horse,” etc. I do have a number of magazine boxes underneath as well which are more a mix of boxes for individual titles (like Mad or Savage Sword of Conan ) along with, like, “Misc. Marvel Mags” and that sort of thing. The part of the table on the far left of the picture is my “new arrivals” section, where recent acquisitions (either from the back room or from colections) are priced and put out, where they’ll hopefully sell before I have to film them away in their regular sections. Those get flipped through all the time, so I do more quite a few out ofthere…my back-issue oriented customers know to poke through those boxes on a pretty regular basis. This is a very long way of me saying that “thinking about space” has been a preoccupation of mine of late. 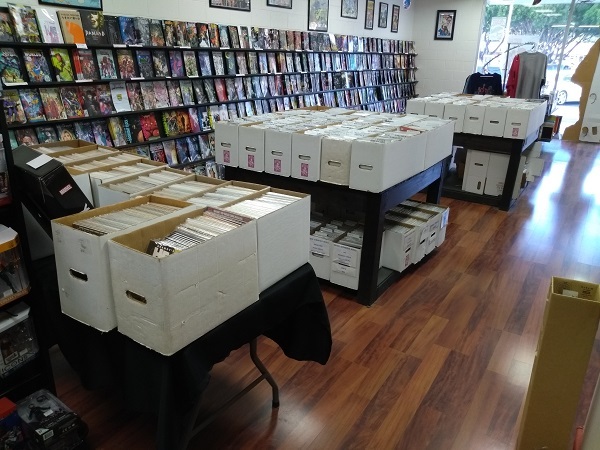 I still have room to expend in the back issue bins…I’ve got space on the shelves behind the counter still, there’s plenty of slack in the boxes on top of the tables, and I can probably fit more boxes underneath that one table if I decide to stow the comic supplies elsewhere. But once all those spaces are filled — then what? The perpaps preferable option is doing some interior remodeling…the back room is essentially divived in two, and if we knocked out part of the divider wall between the front and the back, I could use half the back room for more retail space, while still having the other half for storage. It would take some work and some definite rearranging and some new flooring (since the floor in the back is all concrete) but you know, it’s not impossible. But this is a long ways off, I think. Or maybe not, given the amount of back issues that have been processed for sale lately. It’s not an immediate concern, at any rate, but it is something that I always have to think about. Unless you guys suddenly rush in and buy lots of stuff from me…that’ll leave me with plenty of growing room then! Okay, you may have noticed a couple of problems there, I mean, aside from the typo. First, my comic book store isn’t in Oxnard. It’s in Camarillo, which is next to Oxnard, but it is not Oxnard. Also, while one could perhaps allow for the most generous interpretation of “good food” to mean “oh, yeah, there’s good food at the restaurant next door” or “that meatball sub Mike was eating looked pretty delish,” I’m going to presume that, in conjuction with the follow-up comment, they meant that I served good food. The “good service” note probably wasn’t specifically about me either, despite being 100% accurate. At any rate, it’s pretty clear someone made a mistake and placed a review for some eatery or ‘nother on my listing. Also, it was a three star rating, a middling review (though it sounds like they liked whereever it was they were actually reviewing just fine), which dinged my average a smidgen. I replied to the review noted that it seemed to have been left in error, but never got a response. It took complaining to the platform to get it removed…which itself took a couple of months, but with the amount of traffic they’re dealing with, I understand. I don’t generally worry about reviews of my store. I was more bemused by the situation I described than anything else. But I realize that you just can’t please everyone, no matter how hard you try. I’ve been fortunate in that I’ve had some very kind folks leaving positive reviews of my shop in various places, which is gratifying and showing that perhaps I’ve somehow learned to do a comic shop right after three decades in this industry. But I’ve had some middling reviews, too, and part of my job as Business Owner is to address those reviews, especially when they don’t leave any comments beyond a star rating. I tend to read “3 stars” as “good, but not great,” which is, you know, reasonable, but I would like to know what it is specifically I did to not earn higher, if a comment wasn’t left. I always try to be nice and polite when responding, asking what I could do to improve their experience, etc. Have yet to hear back from anyone, but, well, what can you do. I mean, other than try harder, that is! The reason I’ve been thinking about this lately is that someone dropped a two-star review on me, and again, with no explanation as to why. Just “here you go, two stars,” which…I don’t know, man. I don’t recall anyone being particularly unhappy with me of late. I have had a recent influx of people looking for role playing game stuff, and perhaps this was from one of these folks (“Didn’t carry product line that was never promised or even implied by business that it carried – TWO STARS”). I left a response, again asking “what specifically did you dislike? How can I improve,” but I don’t think I’ll get a reply to this one, either. At least this person appears to have actually been to the store…I looked at the reviewer’s profile just to make sure it was a real person who’s visited the shop and/or dealt with me, and not one of those folks that firehose reviews all over the place to improve their “Top Reviewer” ranking or whatever — had one of those a while back, whose review has since been deleted — and judging by the pattern of places rated this person at least appears to have been in the area. But I have no idea why the reviewer didn’t like my shop, or me…how can anyone not like me, I’m adorable. Wasn’t shy about leaving very specific comments about other reviewed businesses, but all I’m left with is my assumption that the person objected to the fact that I carried comics. Reminder: I said I “generally” don’t worry about reviews. But this one stuck in my craw a little, as perhaps you were able to tell. It just leaves me wondering. What did I do? Did I do anything wrong? Was there dissatisfaction with my available stock or back issue pricing? Or was it something entirely out of my hands? I did have to shut the store down for one day without warning due to some post-surgery complications…maybe the reviewer came by that day and dinged me for that. I don’t know. Anyway, hopefully I’ll get a response and find out. And please do not contact that person on my behalf, should you happen to see the review…I do not want to be one of those guys that “sics” readers/followers on others. Everyone’s entitled to their informed opinion! Like I said, you can’t please everyone, and that’s okay. So long as I’m doing my best. I know that’s a lot to type about something that I’m claiming to be ain’t no thang, and to be really honest, it doesn’t bother me. I presume one of the reasons you (yes, YOU) read this site is for some insight on the day-to-day stuff that goes into running a comic store. One of the things i have to do is, well, respond to customer concerns, and maintain some kind of control and/or interaction with my online presence. That includes social media, online sales, and, of course, reviews of my store. It’s just a thing I gotta do, and hopefully you gleaned some useful info from all this. If nothing else, when you have to leave a middling to negative review for anything, at least leave a brief comment saying why, if you can, just so the reviewee has something to work with. Positive reviews are self-explanatory, I think, and probably don’t need commentary, though I’d be lying if I said I didn’t enjoy reading “Mike is great! I wish he’d adopt me!” or whatever. But if someone isn’t happy with their experience with me or my shop, I’d like to know a reason. I’ve known both these great ladies since they were but wee tykes, and it makes me very…well, emotional to know that they grew up with these kindhearted memories of me. God knows I’m not perfect, and I’ve made dumb mistakes, and probably more than earned the occasional two-star review at times…but reading these nice words from Jo and Weshoyot make me think that somehow during all these years, I managed to do okay. Seriously, you should’ve seen the numbers he ordered just on Robotech . Okay, I said I was going to dn epilogue to the 2018 prediction posts, where I go back and comment on any comments you folks may have left on them…but looking back, I don’t really have anything to add. So, you folks out there go back to the last post, and use the links there to go read the comments everyone left. And thanks to those of you who did leave comments…always appreciated! Remember, early 2020, we’ll do all this again! …Yes, I know you can’t wait. So today, let me tell you about the latest thing from comics retailing past I’m just beginning to dig into. My former boss Ralph recently gave me a sizeable pile of his old distributor order forms/catalogs dating from the early to mid 1980s. That’s prior to my jumping to the other side of the counter in 1988, where I’ve pretty much been ever since. As such, this is a compelling and educational look at the industry from a very interesting time, when the indie market was really beginning to take hold, when “hot” books were changing the way retailers dealt with their orders, when companies were beginning to change things up a little with stuff like Crisis on Infinite Earths and Dark Knight . 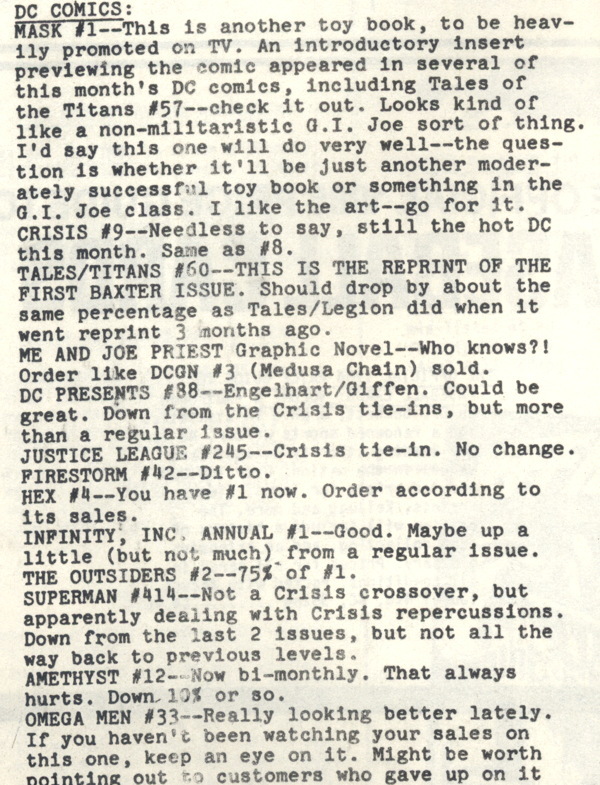 On an even more personal note, it’s a bit of an…odd feeling, I suppose, looking at Ralph’s order for Amazing Heroes #96 and thinking “hey, I bought one of those copies he ordered!” I mean, starting in the early ’80s I was pretty much there every week, so I can literally think that about a lot of things in these catalogs, but for some reason the Amazing Heroes and Comics Journal listings were the ones that got me. Go figure. I’m just picturing Diamond trying something like this now, and how the publishers would almost certainly quail about it. But anyway, I love stuff like this…preses my “fanzine fanboy” buttons something fierce. And go easy on the person who wrote this…yeah, I know “order based on your previous sales” barely counts as advice, you’d think, but some folks needed to be told that. And who knew about Mask ? Maybe it could have taken off, don’t act like you were all certain about it. And there you have it…a lot of material for me to data-mine, as time and eyesight permit. I look forward to going over these, and I hope you enjoy whatever info I can pull out of them over the next few whatever-increment-of-time this project will require. Oh great, I’m going to have to make sure I have both the direct and newsstand editions of all my Swamp Thing comics. “I wanted to add another distinction in the direct market vs newsstand discussion. It’s my understanding that some collectors (or perhaps they’re speculators) prefer newsstand copies released after 1988 or so because of a belief that the newsstand copies are rarer and thus more valuable (especially in higher grades since those tend to get mangled on the racks as you pointed out on Twitter). You can see this in the asking prices of auctions for Spawn #1 on eBay. “Personally, I think it’s ridiculous that whether a comic has a UPC or an ad/Spidey head in a white box on the cover can affect the value of that book. For that matter, I also think that the presence of a jewelry ad insert should not add value to a comic either, but apparently some collectors do. “Interestingly, there is one small subset where a logo instead of an UPC is considered more valuable by certain collectors. In the mid 90’s, after DM copies had UPC’s, DC did some multipacks sold outside of the direct market. The comics included in these had a DC Universe logo in the UPC box. I once had someone offer me $100 for an issue of pre-Zero Hour Legionnaires (I don’t think it was even one of the Adam Hughes covers, but I might be wrong.) just because of that logo! 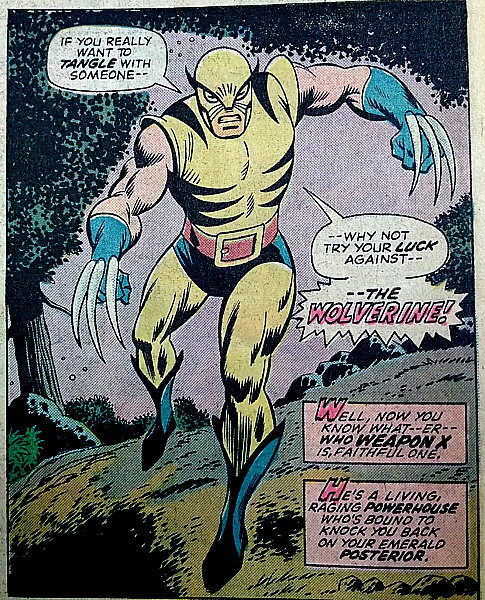 “Off the record, I took his $100 and used it to purchase several mid-grade silver age Adventure issues. Also brought up in the comments by Nicholas is the fact that sometimes the direct market editions of certain comics would have some extra art ‘n’ such in the UPC box, replacing the missing UPC code. 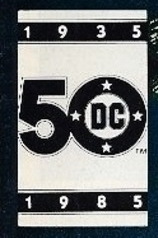 Usually it would be filled with company-promoting slogans like “The New DC! Stop Us Before We Kill Again” or “Have You Read This Crossover Yet? C’mon, What, You’re Too Good for It?” But as was mentioned as an example, Todd McFarlane would often fill the UPC box with extra bits of art, which could make the direct editions a little more appealing to the Spidey fan. This has given me something to think about, or at least pay closer attention to, as you might imagine. I’ve spent a long time with the assumption stuck in my head that there’s no real difference between the two versions if the only difference is the presence of a UPC code. Well, I guess that isn’t necessarily the case. I don’t know that I’ll be going through and raising prices on my newsstand variations, but at least now I’m a little more aware of the phenomenon. I saw discussion here and there online that it’s the 30th anniversary of the whole “Death of Robin” call-in-and-vote Batman thing, and I just wanted to point out that this was the first major regular-public-attracting comics event I had to deal with from behind the counter, rather than as a the mere mortal comics fan I was just a few mere weeks prior. I think I’ve spoken before about how I don’t have quite the recall of this hoohar that I do of the not-that-much-later “Death of Superman,” but I certainly remember the phone calls and the concerned walk-ins and so on. Speaking of newsstand versus direct editions, the version of Batman #427 had the phone number to call to vote on Robin’s fate, and the newsstand edition didn’t. Either version still flies out the door, regardless. Yes, that’s a back issue catalog that I put together and mailed out way back in ye olden tymes of my funnybook selling days at Ralph’s Comic Corner. And that’s all it was…despite being described as a “catalog/fanzine” in the list, and despite Bully’s wishes for inclusion of my Swamp Thing fan-fiction, it’s just titles, issue numbers, grades, prices, and where to contact us to purchase said items. That had almost completely slipped my mind that we even did that. I am curious about the 1990 date on it, however…I seem to recall assembling this catalog from the files we used to list comics on our then-fledgling website, but 1990 seems awfully early, considering the World Wide Web was only available for surfing in 1989. Maybe I’m thinking of a second mail order catalog we put together? And assuming that seller there has the correct date listed, of course. The actual domain name “ralphscomiccorner.com” was acquired in 1998, according to the WHOIS data, and that sounds about right. But prior to that, we just had our 5 megs or whatever of webspace with our local internet provider. I remember we were all pretty proud of securing our space online with that initial website, and had a big banner printed out with “http://www.fishnet.net/~ralphs” hanging in the store, extolling all our customers to go visit. I seem t remember we were one of the first comic shops to have a web page…Ralph has often said that at the time he went looking to see what other shops were doing, and he had trouble finding any, so we must have been up and running on the web quite early. Exactly how early, I can’t recall, though. I’m sure I still have the original files for this catalog on a floppy disc somewhere…the problem here of course being “a floppy disc.” I did back up a bunch of floppy files to CDRs and DVD-Rs, but these didn’t seem to make it. It’s a bunch of documents for the old Mac desktop publishing program Ready Set Go, Version 4.5, so I’d probably have trouble opening ’em up anyway with whatever nonsense I have on my computer now. But I could at least look at the file creation dates and figure out just when I did this thing. Oh, if only I was blogging back in the early ’90s, but I was too busy being EXTREME. Oh, and I keep meaning to mention the format of the catalog…at the time, old pal Rob and I were still doing the comics ‘zine thing, mostly in the format of 8 1/2 by 11 inch pieces of paper folded in half and stapled, with a thicker outer cover (as seen here). So, we were old hands at making up little booklets like this, and the catalog was essentially in the Wood-Eye format, only with fewer naughty jokes. Yes, I do believe some paste-up was involved…printing out the listings page by page, cutting ’em up, pasting them into our work copy, and then taking the whole shebang to the local printers and begging them to make it look purty. So anyway, that’s that…I’m tempted to ask Ralph if he still has the mock-up so I could borrow it and print up a whole bunch more copies and make my fortune in the fanzine market. But I will ask him if he can remember when we first put up our earliest website…the online web archive only started saving webpages sometime in the mid 1990s or so. My own early website, Progressive Ruin 1.0, is archived starting in 1999, but my “What’s New” page (essentially a proto blog) started in ’96, so I’m still not sure how far back the store’s page went. But there you go…if you want any early examples of my comics writing, it’s yours for around $50 at that link at the beginning of this post. A bargain at any price! I mean, technically this would be graded…what, Fair? Poor? It’s certainly not coverless. He had no luck identifying it, or finding it in a price guide, or in online auctions. Asking around, he was advised to take it to me, which was nice to hear, frankly, and boy, it puzzled me, too. You can follow my progress in this Twitter thread, where I put the word out to my online pals if they had any info on the item, but let me present to you in slightly less confused fashion what I observed about this item. I wasn’t a watcher of the Tales of the Crypt HBO show, but I learned that Mr. Vosburg worked on the program, providing ersatz Tales from the Crypt comic book covers for use in the episodes which would reflect that installment’s story. 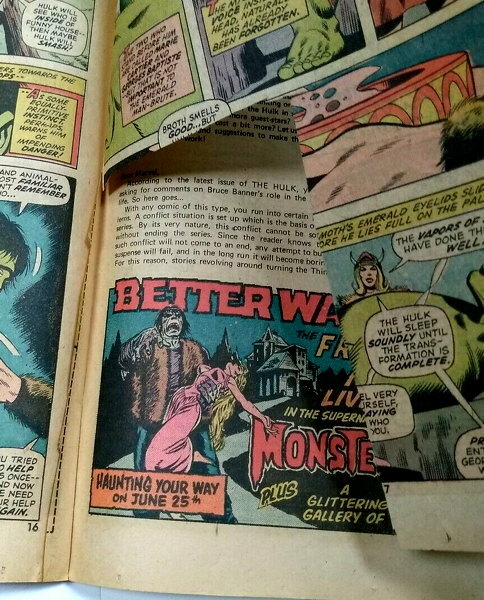 Next, I noticed that the cover image was in fact a separate piece of paper glued over the cover of the comic, which was a copy of Vault of Horror from the Russ Cochran reprint line (#4 from 1993, specifically…thanks, still visible copyright info on the inside front cover!). Now, my initial thought was that the comic was some kind of print sample used by the publisher, maybe, or a prop from the TV show. However, looking at some of the episodes online, Vosburg’s cover illustrations were usually presented as being pages in a dusty tome the Crypt Keeper would open and show the audience, and not as an actual comic book. 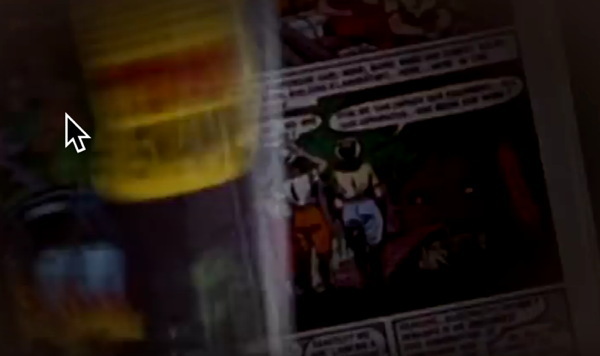 Freeze-framing the video, the comic pages definitely match up between the film and the item in my possession, with the clincher being the end bit where the extra page of art is shown leading directly into the film’s story. 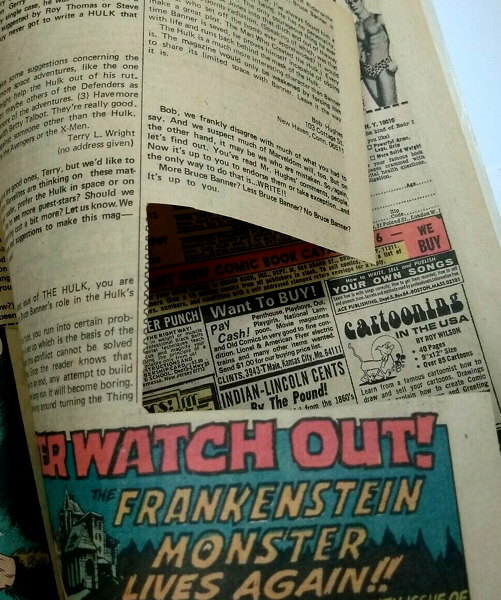 Now, I suppose some EC Comics superfan may have cobbled this together on his own, printing out the pic from Mr. Vosburg’s website abd doing his/her own mock-up, but that seems unlikely. 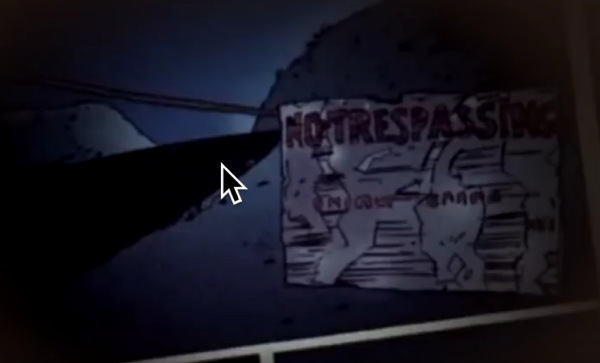 Also, given what details I know about where the comic was obtained, I’m pretty sure this is The Real Thing. The current owner of this comic should be forwarding some documentation to me regarding his purchase of the item, so I should have more details shortly. Which I’ll need, since we’ve come to an agreement that I’ll be selling this for him. So watch the eBay skies! One interesting note: the extra page of art is attached to and covering up another page of extra art. It seems to show more ore less the same sequence of events, just with some different staging. Wish I could get a good picture of it without tearing pages, becase I guess in a weird kinda-squint-right way this is a previously undiscovered alternate take for the film! Okay, it’s just production art, but hey, you didn’t know about it! Anyway, this is one oddball item to have just fall into my lap like this. Definitely a unique piece of EC Comics history. ADDENDUM 11/22/18: I received a comment elsewhere from someone who’s confused two different prop comics that are featured in the film. 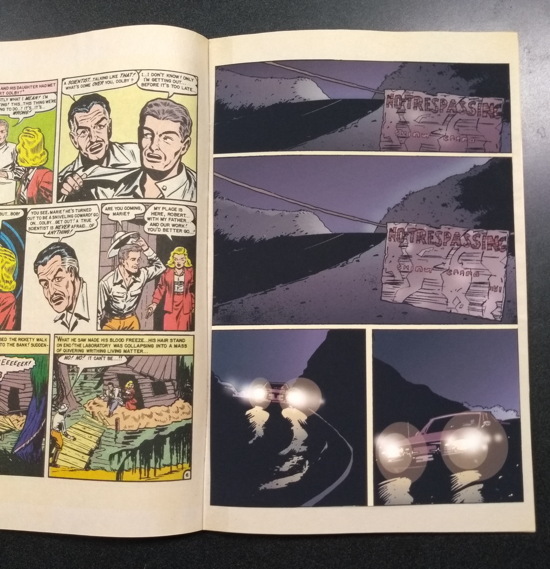 The comic in my possession is the one that appears in the first few minutes…as pictured in the GIF above, the pages are flipped, landing on the newly inserted artwork which then leads into the movie proper. There is a second, different, prop comic that appears much later in the film, featuring other inserted Vosburg pages, which you can see at the bottom of this page. I don’t have that second comic…it’s probably being held by my evil alternate universe counterpart, the one with the goatee. 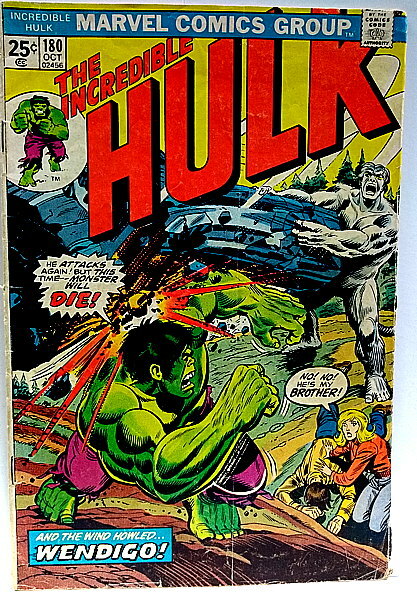 ADDENDUM 2: Oh, and the comic apparently came from this estate sale. “Knowing which flaps to fold in, in which order” is pretty much advice for everything in life. So I was putting together some of those fancypants comic book short boxes for display…you know, the ones with the graphics printed on them as opposed to just the plain white boxes you normally see…when I got to thinking. I’ve noticed over the years, the many, many years I’ve been at this, that when someone first comes across a comic box for the first time in its flattened form, it can be a little puzzling to figure out just how to assemble it. I mean, okay, it’s not like the Hodge conjecture or anything, but it can be easy to start folding the wrong bits first during a first attempt at putting one of these boxes together. As you can see (or maybe not see, as I’m still trying to fix the images-not-loading-in-RSS-feeds thing…will be working again soon, I hope! ), the majority of respondents openly lied informed me that they puzzled out these cardboard contraptions on their own. Only a third as many had to have somebody show ’em, and a just a bit less than that don’t know how to do it at all (more on that later). And really, it’s no problem. It’s just a matter of knowing which flaps to fold in, and in which order. Someone responded to my poll, noting they learned from the box itself, which had printed instructions, something I forgot to consider since I hadn’t seen one of those in years. I don’t know…for some reason, I was picturing this as arcane nerd knowledge, passed down in oral tradition from learned experts to the gathered supplicants, who would then teach the skill to the generations that follow. That last option, about still not knowing, isn’t a huge deal. Some people may not store their comics in boxes, or don’t have enough comics to even fill a box, or may not be comic collectors at all, and just answered my poll because they follow me on the Twitterers and decided to show me a kindness. I mean, the poll’s range was largely biased toward comic fans, as most of the people on Twitter that follow me and aren’t Russian spy-bots are also people who are into comics. Which of course doesn’t mean there aren’t collectors who don’t know what to do with these boxes. I noted to someone on Twitter that I’d seen my fair share of boxes where whoever tried to assemble it started off with the wrong fold or flap or whatever and just decided to give up and duct-tape the thing into a box-like shape. And someone working for another comic shop on Twitter verified that they’ve also seen the dreaded “held together by tape and probably a lot of cursing,” so it’s likely a widespread phenomenon. Anyway, just one of those thoughts that goes through my head when I’m at the shop putting together my one millionth comic box. …Okay, maybe “one millionth” is exaggerating a little, but not by much. I do eventually start talking about comics. So…feeling a little more…secure while visiting my site? Well, I certainly hope so, after the trouble I had Saturday trying to get my SSl certificate in order here. Anyway, if you are on my site, and not just reading through a feed reader of some sort, if you look up to the address bar in the browser of your choice you’ll see Progressive Ruin Dot Something or Other now has a little padlock symbol on display. No more “this website isn’t secure” warnings when you visit or try to leave a comment! Your personal information is no longer captured by me and sold to Rufus T. Firefly in the distant land of Freedonia! A few days ago I installed one of those SSL thingies on my store site with no hitch whatsoever, so I decided, during a brief lunch break on Saturday, to do the same for ol’ ProgRuin. And of course, instead of being a quick install, my images broke, then my page wouldn’t load right, then I somehow managed to lock myself out of my site with no way back in, blah blah, other dumb stuff. “You know just enough about computers to be dangerous” a programmer friend once told me years ago…and while I’ve learned my way around the computatrons a little more since then, I certainly proved her right that Saturday afternoon. Anyway, it’s done, and my site is more or less secure. If you’ve bookmarked the “http://” version of the site, it should automatically forward to the secure version. I have a couple of straggling HTML pages separate from the main blog that need some adjusting (not this one, which is now secure as well as perfect), but otherwise you should see that little padlock wherever you go the site, reminding you that your credit cards are all safe with me, so just send in those numbers whenever you’d like. So the other thing I did on Saturday, aside from thinking “well, maybe I can move my blog over to pogressiveruin.com,” was the Halloween ComicFest, one of the various special comic days during the year trying to expand the success of Free Comic Book Day to other parts of the year. And I did manage to have a pretty good turnout…had a line of folks waiting outside the front door when I opened, which is always a good sign, followed by periodic waves of business throughout the day. In general, I don’t order huge numbers of the Halloween books, since the turnouts for this event aren’t really a patch on FCBD. But I do, and did, get quite a few people in, Saturday (the official day of the event) and Sunday, so I try to have enough on hand. In some cases, like for this year’s Ms. Marvel book, I ordered a lot extra just to have ’em around as giveaways in the future. As it turned out, I burned through the majority of the books I had this weekend, with only relative handfuls left over. Even that Ms. Marvel issue was nearly wiped out. You may have noticed above that I gave away these comics on Saturday as well as Sunday, and that’s because the timing of the Halloween ComicFest is always so…peculiar. I mean, “Halloween” is in the name, so it always takes some explaining to establish that, no, the event isn’t necessarily on Halloween, but on the Saturday just prior to it. Yes, it says the actual date on the promo materials, but it also clearly says “1ST SATURDAY IN MAY” on the Free Comic Book Day info, and I’ll still get folks coming in on May 1st looking for the freebies. What I end up trying to do is, while not overloading on the giveaway comics, try to order enough to actually carry me through to the Halloween day itself. This time around I could be a tad short…but then, Monday and Tuesday usually aren’t blockbuster days, so the supply I have now will likely be little changed by the time Wednesday rolls around and business picks up again. In the end, it was a lot of fun, and I gave away plenty of comics, and made some good sales, too. Like Free Comic Book Days have been for me since the beginning, the event paid for itself. Even had a few folks show up in costume…at least one Squirrel Girl made it in that day! So, that was my Saturday. Lots of customer traffic and folks happy with their free goodies, and computer travails. I know which I prefer on any given business day.